This issue of the Washington Memo provides an overview of U.S.-Nigeria policy and suggests strategies to overcome violent conflicts through nonviolent peacebuilding and trauma initiatives. These kinds of programs will help lead to a healthy and peaceful Nigeria. Read the full Washington Memo. Climate change:The EPA is repealing regulations for methane leakage at natural gas extraction sites. Removing these regulations will likely exacerbate the effects of climate change and be detrimental to the health of residents near extraction sites. Additionally, the Bureau of Land Management (BLM) rolled back similar methane regulations on public lands. In response, the states of California and New Mexico have filed lawsuits against the BLM. Immigration: In late September Congress passed a continuing resolution (CR) to keep the Department of Homeland Security running through December 7. The CR contained $1.6 billion for new border wall construction but this amount could go even higher in future negotiations (resources). A new “public charge” regulation set to go into effect later this fall will keep some immigrants from accessing benefits such as food stamps and Medicaid. Mexico: Recent reports indicate that some U.S. foreign assistance funding is being reallocated to the Department of Homeland Security to deport non-Mexicans from Mexico to their home countries. The reports raised red flags for many civil society groupsconcerned about the dignity and rights of migrants. January 25, 2019 is the deadline for submitting essays for the annual MCC U.S. Washington Office essay contest.Essays should be submitted to your nearest MCC regional office. 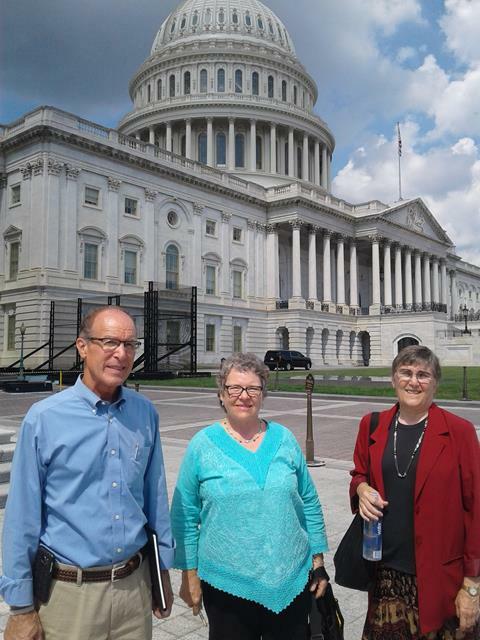 On Sept. 4, we were glad to accompany several members of a Virginia Mennonite Missions work group to Palestine and Israel (photo) as they met with their congressional representatives. Charissa Zehr was part of the organizing committee and attended the Global Peace Forum on Korea in New York City on Sept. 29-30. Tammy Alexander spoke at the Mountain States Mennonite Conference Immigration Round Table in Fort Collins Colorado on Sept. 29. She also attended a prayer vigil at the Aurora Detention Center and an evening event at Casa de Paz, a hospitality house for immigrants released from Aurora.